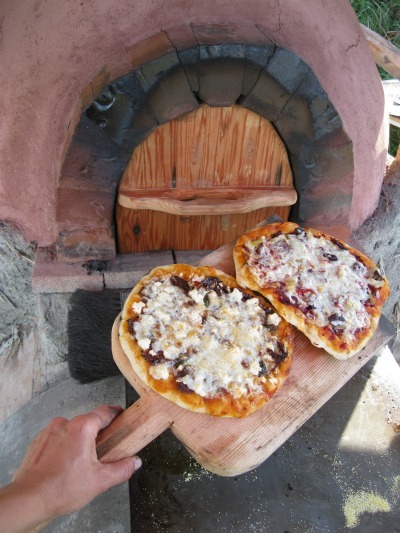 Success from the first Cob Co-op Project – our Cob Oven! From Cris LoScerbo, our South End Cobbing Cobbler Maven…. The first project was a huge success and we had over 25 participants and visitors over the course of our three day workshop! THANK YOU to everyone for your participation and support! We learned about cob basics, foundations and roofs, oven details and over all skill building, while enjoying all local food from the Wednesday Bowen Road Farmer’s Market and our own garden! If you’re interested in reading up on cob ovens (our previously built cob project), heres the book for you: Build your own Earth Oven – Kiko Denzer! 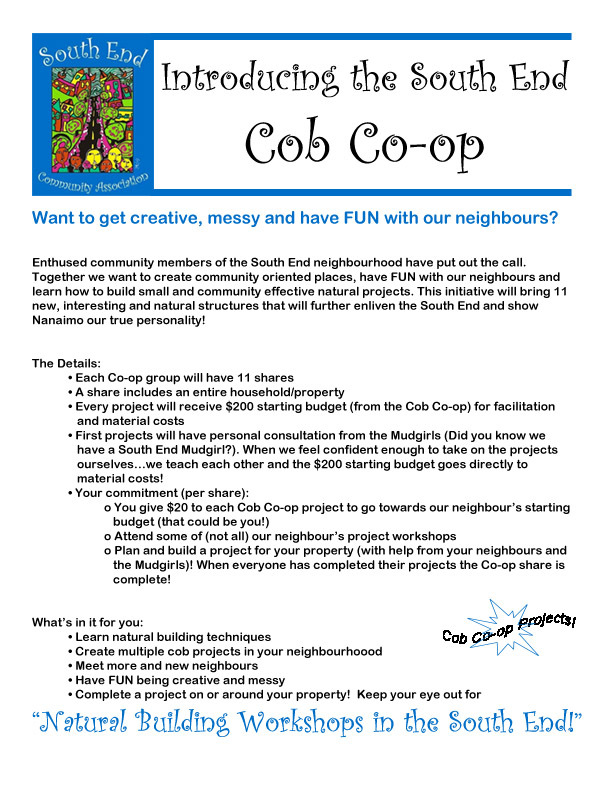 Interested in joining the South End’s Cob Co-op? Come to a workparty or workshop and get an intro to what you could also build on your property with your South End Neighbours! Together we are creating more beautiful expressions and displays of what make our neighbourhood unique, inviting and exciting to be a part of! We have 6 co-op spaces available and we want you to join us! Please read the details of our Cob Co-op and choose to be one of our lucky neighbours: Sign up to be a Cob Co-op share holder! 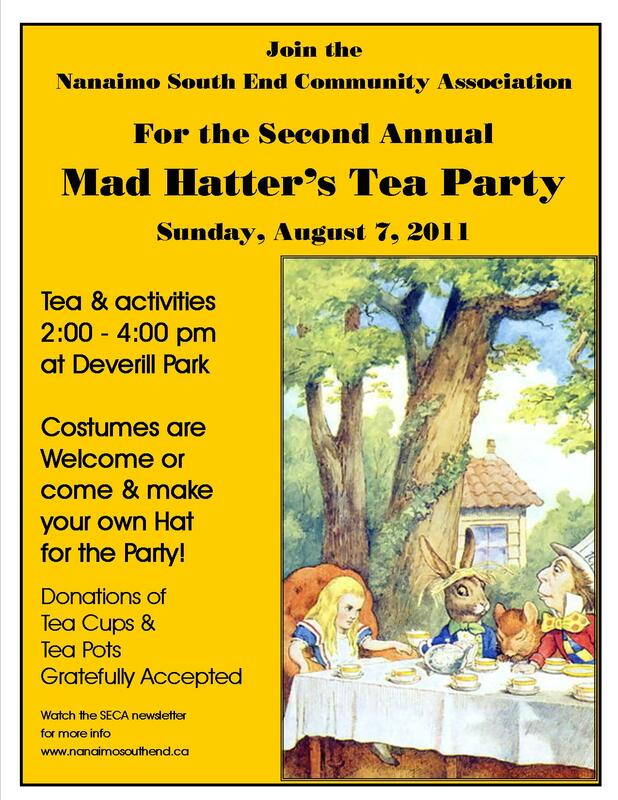 2nd Annual Mad Hatter’s Tea Party Coming Up! Welcome to the Second Annual Mad Hatters Tea Party! It was a great success last year and we’re looking forward to another gala event sponsored by SECA! · There will be materials available for making hats at the event – but if you the urge moves you, come as your favourite Alice in Wonderland character! You won’t be alone! · If you can, please bring a chair to sit on. For pics from last year, click here. Hi all: I pulled this from the DNBIA e-mail newsletter. Although the local rash of B&E’s is not in our area, I found it interesting info. The central area of Nanaimo is currently experiencing an increase in break and enters and business and home owners are asked to be on the lookout for suspicious activity. Since July 1, seven break and enters have been reported in homes in the areas of Rosehill, Townsite, Cadogan, Pryde and most recently Hunter St. In the last incident the suspects entered while the home was unoccupied and gained entry through a rear window. Small items were taken and neighborhood inquires were negative. Most of these occurrences are happening between noon and 4:30 pm, the time when most people are still at work. Only small items that can easily be carried and concealed are being taken. Thieves are entering through back yards and going in through unlocked windows. “Based on what we know to date, it most likely involves young teenage males who have been able to blend in with their surroundings and not be detected,” said Constable Gary O’Brien, media spokesperson for the Nanaimo RCMP. If you see something in your neighborhood you think is suspicious, report it to the police or at least monitor it . It might be as simple as seeing someone walking up your street who seems to be more interested in looking at homes, rather than making eye contact with you. Make a note of this person and when you saw them. Watch to see where they go and share this information with your neighbors. It might be nothing or it might be the piece of information that police need to catch those responsible. If you’re fed up with the high cost of owning a car or looking just to use a car on an occasional basis, the non-profit, member-owned Nanaimo CarShare Cooperative (NCS) may be just what you’re looking for. It’s especially great because their first car is situated right down the street at Port Place Mall. NCS Members reserve time on shared vehicles through a simple, on-line booking system or by phone. Then you get yourself to the car, where you access the vehicle through a security system and return it to the same spot before the end of your reserved time. Members pay usage fees assessed by the hour and kilometre. The Cooperative pays for fuel. If you used a vehicle during the month, you will get an invoice once per month itemizing each trip. The volunteer-staffed Cooperative provides and pays for insurance, keeps the cars clean and maintained, orients new Members, and assures smooth operations. And through “roaming” agreements with Vancouver’s Cooperative Auto Network and Victoria Carshare, Nanaimo CarShare Members will soon be able to use these organizations’ vehicles as well. For more information, visit http://nanaimocarshare.ca, email nanaimocarshareinfo@gmail.com, or call 250-741-4141. 2. Amend Section 6.10 pertaining to fence height to maintain the fence height regulations for residential zones (R1/R1a to R10and R13 to R15) for side and rear yards at the same height as found currently in Zoning Bylaw No. 4000. This increases the maximum size of side and rear yard fence from 1.8m to 2.4m in the stated residential zones. The maximum size of an urban food garden on lots greater than 2400 square metres is increased from 600 square metres to 25% of the lot area. Picnic Review – We all felt it was another great success. A big thanks to everyone who participated. Some suggestions were made for next year; The Silent Auction should be near the Art Tent so that parents of children can participate. Some sort of traffic control needed for all the trucks and coming and going during the set up period in the morning. YNP Community Garden, Andre Sullivan of YPN told us of how pleased he was of the support of S. End residents. 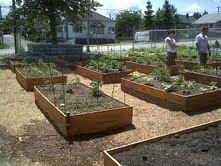 There are now 15 beds with vegetables planted and growing. This food will be donated to the Food Bank. Ten to fifteen new beds will be opened up for residents and five people have already signed up. Plots are $30 a year which includes water, fertilizer, and soil. There will soon be picnic benches and art bins on site. Bulletin Board. We now have a community bulletin board at the corner of Irwin and Milton. This was built and installed by the City. Pat Squire mentioned that he still has the timbers from the old Buckerfields site that were to be used for our original bulletin board design. It was suggested that we can still do our own bulletin board elsewhere and erect it on private property. Cob Coop, Chris said the first project was a huge success. There were 6-8 people participating each of the three days. The first cob oven has been built and she will let people know when the firing will happen. Looking for a garden bed? There’s still time to plant a garden this summer! And there are some beds still available at the South End Community Garden!